The 3000 Series features downdraft airflow, whereas clean air is forced in through the ceiling style intake plenum and exhausted through a pit located in the floor of the booth. The supply and exhaust filter layout is designed for even velocity throughout the working area of the booth providing consistent air flow required for a quality paint job. Using positive pressure within the paint booth prevents contamination from entering the booth. Cleaner air translates into cleaner higher quality paint jobs. Horizontal orientation for optimal illumination. All interior accessible for ease of maintenance. Get all the details and learn what Garmat can offer. Garmat spray booths offer the most effective airflow in the market. Engineered with production enhancing features that help increase your throughput while decreasing your operating costs. High efficiency throughout, whether it be incorporated in the actual operation of the spray booth or simplifying maintenance to ensure continued optimal performance. The 3000 Series cabin is constructed of durable powder coated fully insulated solid interlocking G-90 galvanized steel wall panels. The 3000 Series cabins utilize ten-foot wide insulated tri-fold door assemblies with built in personnel access doors and large observation windows for high visibility. Garmat Touchscreen controls include all the functions you need to run your operations efficiently. User friendly interface features switches and touchscreen, with self-diagnostics built in. Optional WIFI upgrade allows you to operate and monitor your paint booth from a smartphone, tablet or PC. Data retrieval capabilities also available. All Garmat USA products are provided with a listed industrial electrical control panel. All components are recognized, listed or certified by UL, ETL or CSA. All booths come standard with a pre-wired control panel for reduced field installation time and costs. Garmat controls are built in our very own 508A ETL listed shop so every panel produced is built to the most recent ETL specifications. Employing our own ETL shop allows for infinite possibilities in customizing each shop’s panel, from the simplest functions to a touchscreen complete with any imaginable paint recipe. Garmat certified staff quality controls and tests every piece of equipment that leaves the facility; we are not dependent on standards set by an outside company so we can ensure that the panel meets the quality standards Garmat Equipment is known for. Paint shops rely on their booth for consistent temperature and fast, controlled bake cycles. Garmat USA offers quality performance in a 98% efficient direct-fired burner. The direct fired burner is the most efficient method of heating air for a paint booth as the airflow pattern is closely controlled using profile plates resulting in 98% efficient combustion. Garmat HMA/AMU’s are purposely designed to be efficient while still providing a superior painting environment. All Garmat HMA/AMU’s are designed in house. By designing and manufacturing our own mechanical systems we can ensure that your HMA/AMU is built to the exact specifications your paint booth requires. From cost efficient to high end, Garmat can design AMU/HMAs to fit any budget. Each Standard Garmat HMA/AMU is listed (42106, 46008, 99223, 9937, 1275) and built to ANSI Z83.25 standards for Direct Gas Fired Process A heaters. The Industrial Process Certifications is critical as it applies to the specific standards and safety measures required for direct fired burner used in the refinishing industry. Garmat USA HMA/AMUs were the first in the market to carry this listing. Different fan designs have a major impact on stability and consistency of air flow. 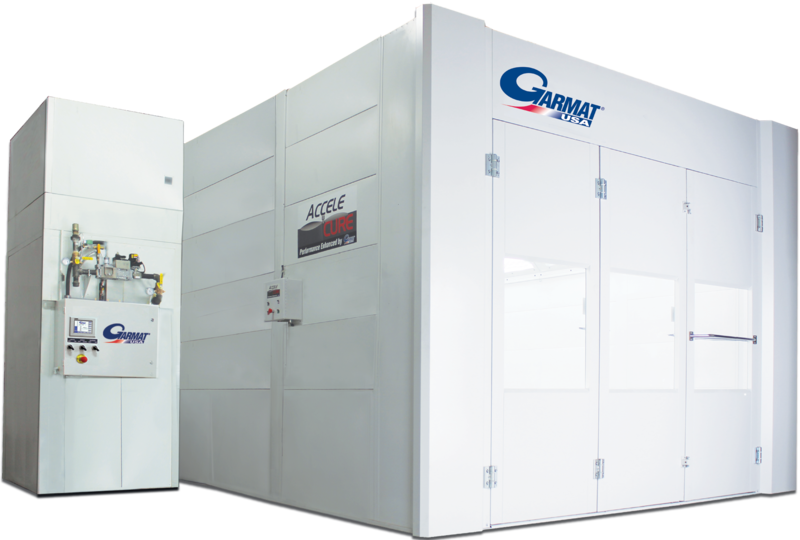 That is why Garmat uses only Airfoil Dual Inlet Reverse Incline on their standard line of automotive spray booths. The backward direction of the blades creates a vacuum of air surrounding the fan which prevents overspray buildup. These types of fans are capable of operating in a broader range of static pressure area so the airflow remains consistent. Since these fans run at a lower RPM both noise and energy costs are reduced. Lighting quality and placement is critical for color matching. Garmat USA booths feature horizontally oriented light fixtures equipped with color corrected fluorescent tubes. The horizontal design allows for continuous lighting above and below the belt line, unlike vertical oriented fixtures, which not only create uneven lighting patterns but are also easily blocked by the painter. One of the primary considerations when evaluating a paint booth is the filtration system. Having an exemplary filtration system will not only provide a better atmosphere for painting, but will also provide a safe surrounding for paint tech, staff and local community. Garmat USA’s filtration is designed to achieve both these goals and ensure the cleanest possible painting environment in the industry. Not only do our filters achieve 99% capture efficiency, but they also maintain that efficiency at the airflow required for a high quality paint job. 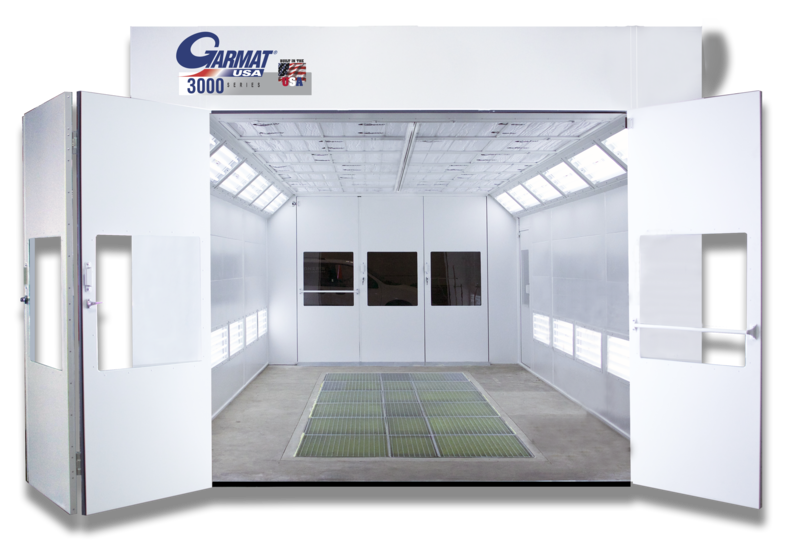 All Garmat USA automotive paint booths feature easy access filtration systems which simplifies the maintenance required to maintain optimal performance. Easily accessible and serviceable by one person saves labor costs. Steel knife edge closures on the ceiling filters provides a tight and secure fit. Garmat filtration systems exceed the 2011 EPA 6H Regulations for Surface Coating Operations.